If you are a regular reader of this blog, you already know, that I am a diehard Edmonton Oilers fan. You also know, that I am a huge supporter of the changes that have recently occurred within the organization. In my opinion, Mike Babcock is the best NHL coach in today’s game. If we manage to get somebody of his caliber to steer the ship. The franchise would be considered an instant playoff contender. I love the moves they club has made so far and it’s just the beginning. Todd Nelson has done a good job. But if you’re going to change the front office to people who know how to win. Also, add a veteran bench boss! Money won’t be an issue, neither in how much Babcock is offered, nor in the team being able to spend to the cap. Nicholson was the Hockey Canada executive who put together each Team Canada. 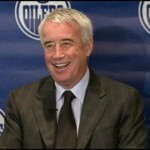 He’s now the businessman in charge of the Oilers. The hockey ops folks will report to him, not directly to Katz, which should lead to far more accountability in all areas of Oilers hockey, a welcome sign to anyone considering joining this group. Nicholson and Babcock won two Olympic gold medals together in 2010 and 2014. Why not try to replicate such success in Edmonton? Chiarelli led the Boston Bruins to the playoffs repeatedly and built a team that won a Stanley Cup. He, too, was part of the Hockey Canada group that led this country to gold in Sochi, so he has that connection to Babcock. Babcock will have some sense of how he will work with Chiarelli from that. The Oilers need a highly respected coach to make sure everything is done right with McDavid. Babcock would also likely relish that kind of responsibility and opportunity. 5. Ryan Nugent-Hopkins, Taylor Hall, Oscar Klefbom, Jordan Eberle, Darnell Nurse, Leon Draisaitl, Nail Yakupov, Justin Schultz, Anton Lander. The Oilers are loaded with young talent in need of proper guidance. It would be a mighty enticing prospect for any coach to have the opportunity to develop this group and be the one who finally turns things around in Edmonton. 6. Babcock has coached in Alberta and is a Western Canadian. He’d be coming home to Western Canada. Lots of folks yearn for that in life. Maybe Babcock is one of them. The team heads into a new downtown arena in 2016-17. So long crappy old Joe Louis. Of course, Detroit is also getting a new arena soon, but compared to other NHL destinations, Edmonton will be tops in terms of place of work. The new Edmonton arena will have state-of-the art facilities, an outstanding design and a built-in practice arena beside the main ice sheet. It will be the envy of the league for years to come.